What I eat in a week videos and blog posts are my favourite to watch and read. 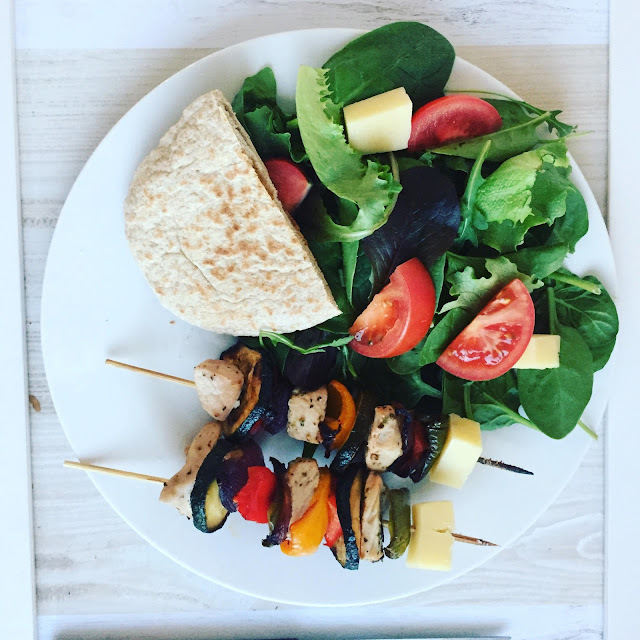 I love finding new recipes and getting inspiration and now that I'm back on it and making a conscious effort to eat well, I thought I'd share with you what I eat in a week - the Slimming World edition! So far having been on Slimming World a month, I've lost a total of 11lbs and received my 1/2 a stone award and am 2lbs off my 1 stone certificate. I usually eat fruit for my breakfast every day and sometimes switch it up with veggie sausages and some baked beans at the weekend. I also normally have leftovers from the night before for lunch or make myself a chicken or ham salad, but anyway, onto the Slimming World evening meals. One of Jay's signature dishes (when he actually rarely does the cooking) is a delicious chilli. I never used to be much of a fan of Chilli but since Jay made it for me a couple of years back I decided I actually really liked it and now we've found a slimming world version it's the perfect mid week meal. I prefer to have mine with some plain steamed veg as I find this really fills me up, but you can also make it with some boiled rice or quinoa too! It's a great meal for batch cooking and I often take my leftovers in during the week for lunches at work. 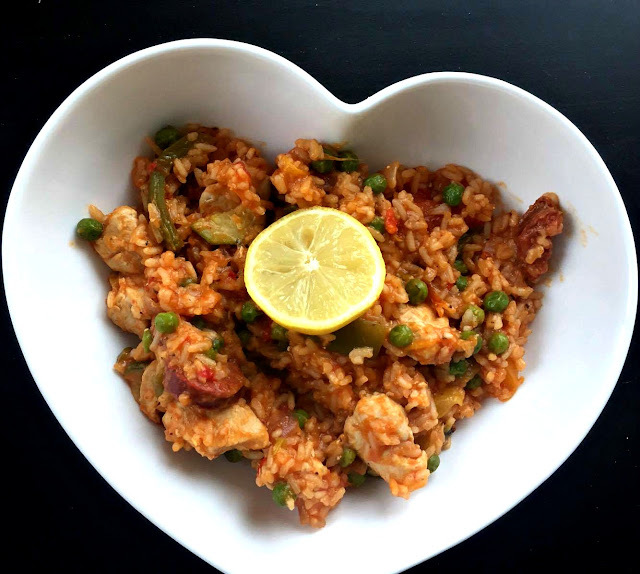 If you haven't tried the Slimming World Chicken Paella then why the hell not? It is so tasty! It may not be a fresh paella from the Spanish coast but it is delicious none the less and it's so easy to make. It's syn free without the Chorizo but you can add this in and syn it accordingly if you prefer! 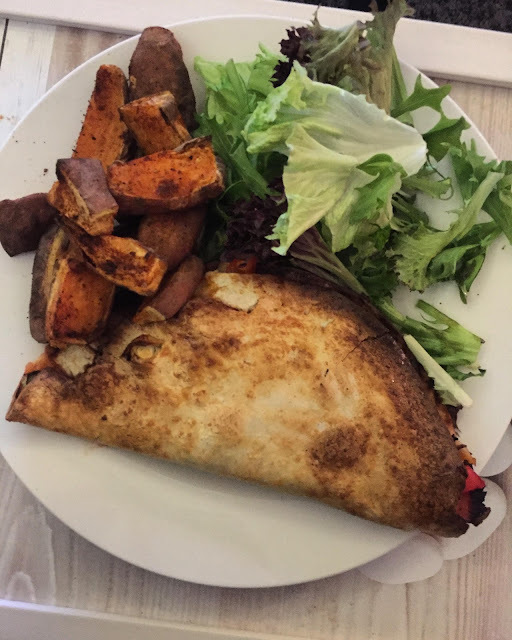 The Slimming World Calzone is a new recipe we tried after seeing it on Pinch of Nom's page. We usually used to make a wrap pizza which is delicious and we still do it from time to time, but the Calzone is just something a bit more substantial. It's so easy to make, you need a weight watchers wrap (hex b), any vegetable fillings (we use mixed peppers, spinach and cherry tomatoes (all free), we also add in some ham or bacon medallions (free) and top it with some reduced fat cheese (hex a). All you do is pop the ingredients on half of the wrap with a passata base and then fold the wrap over. Glaze over the top with a beaten egg to make the edges crisp up and pop it in the oven for 15-20 minutes. Serve it with a side salad or some slimming world chips. Such a lovely hearty meal! We love having it during the weekend to prevent us from having takeaway cravings! Jay and I both love a Greek meal and you can't beat a Pork Souvlaki from time to time. I like this meal as it's full of speedy salad and vegetables and the pork is marinated in a delicious zingy herb seasoning. I sometime serve mine with some light mature cheddar or halloumi for a hex a and half a wholemeal pitta for my hex b option if I haven't already had it throughout the day. It's such a delicious meal and I would happily eat this once a week, it's so easy to make. Salmon is one of my favourite things to eat for dinner. It does wonders for my skin and is really healthy too! I like to cook my salmon in the oven with a lemon squeezed over it and some mixed herbs. 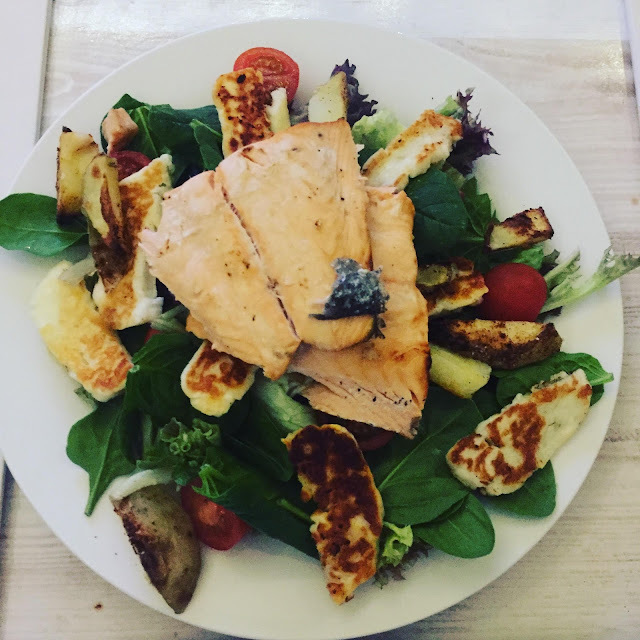 I then like to make a big speedy salad, cook some halloumi (and sometimes some slimming world chips if I'm feeling extra hungry) and serve my salmon on top. The lemon definitely makes the salmon taste so much better and I love eating this during the week! It's so easy and quick as well, takes around 30 minutes to cook the salmon and then you're done. 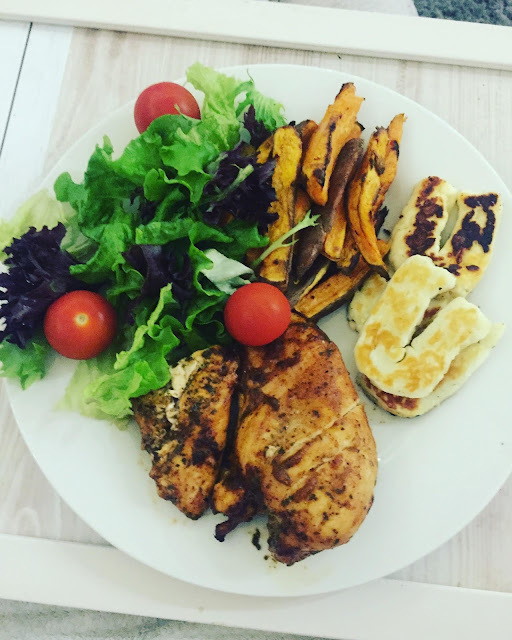 Another really easy and quick meal to make is Cajun Chicken with Slimming World Chips and Salad. As you can tell I also really like Halloumi so I often add some of that to my meals if I'm craving it (it's all about moderation though hey). I tend to coat the Chicken in a Schwartz Cajun seasoning for Chicken, it's SO nice and syn free on Slimming World so this is a winner Syn free dinner! I love fish and chips and although you can't beat a good old greasy chippy tea from your local takeaway on Slimming World that's a no go so we have to make do with a healthy version! 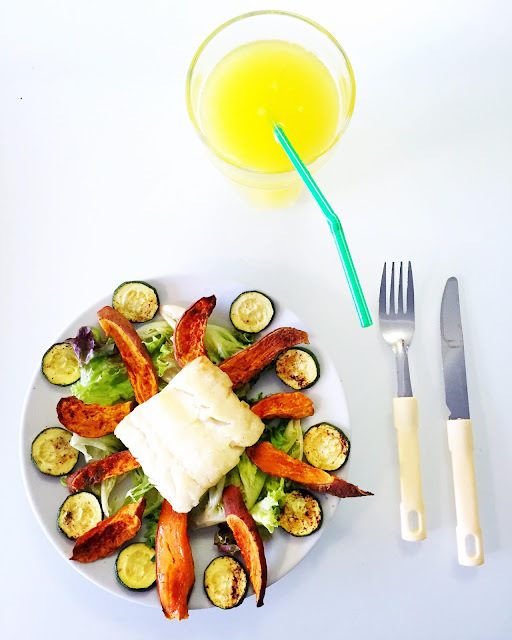 I love white fish so if I add some herbs for seasoning and a bit of lemon, cook some sweet potato wedges and roast some courgettes and serve with a salad then that's the perfect alternative. So healthy too! Have you tried any of these Slimming World meals? Are any of you following the Slimming World plan? How are you getting along? I'm absolutely loving it and seeing the results so far makes me so motivated to stick with it and continue to gain more confidence in my body! Ooh I love this type of post too because I always get bored of eating the same things! I love paella and the halloumi and salmon looks and sounds delicious. I'm currently NOT enjoying a sugar free yoghurt so this has made me really hungry even though its early haha! I always think that Slimming World meals look ever so delicious! I’ve tried to get into quorn and meat free food so many times (for less calories) and I just can’t get on board at all! I wish I liked it! The quorn chicken nuggets are my favourites if I'm feeling like a naughty meal! I can't really taste the difference of the mince either!